A few months ago I was going through league champions, top goal scorers and managers in Belgian football. As I tend to write a 'Back in Time' segment, I went back to the 1910s, looking for a fresh piece to write. English football has deep roots in Belgium, along with the rest of the world, a lot of English and British people have succeeded in The Battleground of Europe and one player who I'm focusing on is Maurice Bunyan. Bunyan was a player who mainly played and managed in France and Belgium. An ex Arsenal and Chelsea player too, he represented Great Britain in the Olympics and also was in the military. As a player on the continent, he played for Racing Club Bruxelles and Stade Français, spending over 20 years playing in Belgium! In his time there he twice won the Golden Boot in the Pro League. Football was in his family. His father, Charles Bunyan Sr, was a goalkeeper who spent his entire career playing in England playing for the likes of Derby County and Newcastle United before moving to Belgium to coach his son in Brussels, and then going on to manage Belgium, Standard Liège and Anderlecht, with a brief stint in Sweden in between. Charles Bunyan Jr moved to Brussels with his dad, playing under his dad and with his brother before moving back to England to end his career at Chelsea. Sadly senior died whilst managing Anderlecht and junior stepped in to take charge of Les Mauves for three seasons. Maurice also went into management after completing his book 'Le Football Simplifié' taking over at Bordeaux for two seasons in the mid 1940s. The book is fascinating. 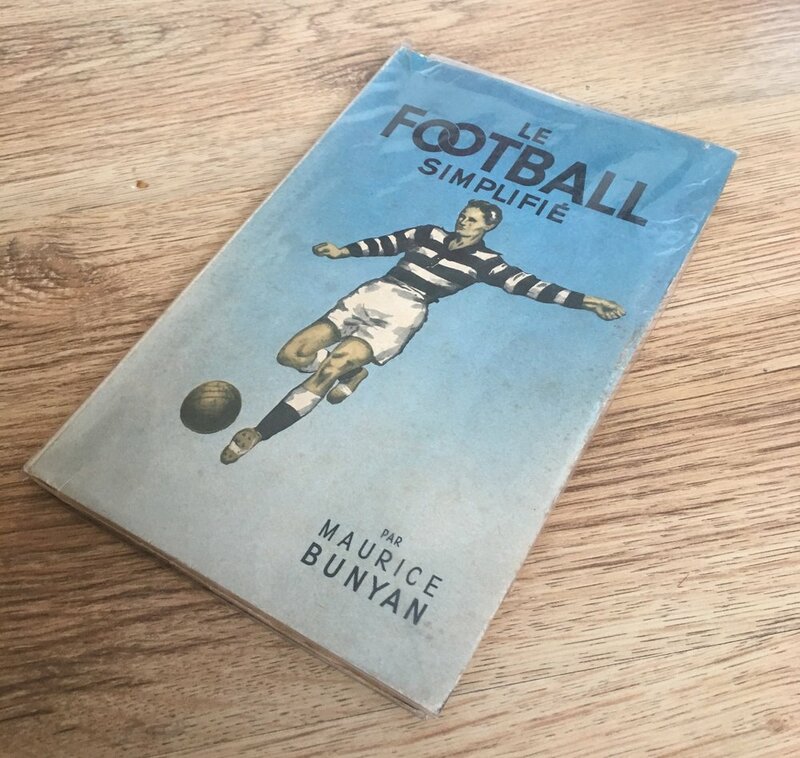 Completely written in French, Bunyan explains in that the opening gambit how football can be good, what age you should start, how long you should play for and what clothing to wear. Maurice explains what you should wear, stating that it should be a wool sweatshirt and a belt, but preferably having an elastic waistband. He also says you should have two pairs of boots for wet and dry conditions and what material they should be. Obviously this is all common knowledge now and maybe I'm being closed minded, but for a book written over seventy years ago, he goes in depth and looks ahead of his time. As you continue reading, Maurice Bunyan literally tells you every step on how to play football. Beginning with dribbling, he tells us how to kick the ball, how far, with which part of the foot and so on. Then moves on to holding off opposition, passing, shooting, throw ins and heading. Quite an extraordinary read because it's not an 'idiots guide' but more a manual on how to play football. Once he has gone through the basics, he then moves on to every individual position on the pitch, explaining how to play, train and almost what to do, saying what a goalkeeper does and how they train. Catching, saving high and low shots. Diving. It's entertaining. When speaking about defenders, he notes five key factors that are essential to being a great defender. Those being decision making, speed, courage, a calm head and anticipation. That's all fair. Not many defenders possess all five of those things in modern football but to be the complete defender, this is what Maurice Bunyan feels you need to have. I love this because of the list of key factors he gives each position. Through diagrams and pictures, he tries his best to give examples on how to perform the action he has written. As this book is so old and dates back to during the Second World War, he uses a lot of examples involving what was then arguably the greatest team in the world, Arsenal. He would use formations and Arsenal players as examples on how to perform certain things. He'd also explain 'Methods of Play' saying there are four different styles. A Scottish way, English, Central European and, in his word, a Latin Country style. He states that Central European and English is very close to the Scottish way, but the English way can resemble the Latin Country style too, which consists of a French/Spanish/Italian way of playing. Without giving a full review of the book, which features a foreword by Jules Rimet, it shows me that there are a lot of great British coaches who are forgotten in football. From Bill Nicholson, to Herbert Chapman and so on. Beyond the greats like Ferguson, Clough, Shankly and Paisley, there are pioneers who made it abroad and stayed abroad at a time when football was building its foundations. The ones who took a ball on a boat and spread the word of the greatest game, and that includes the Bunyan family, not just Maurice. We are a nation who can be insular and don't really like the unknown, but when I read a Brit has taken the leap abroad, you can't help but envy them and kind of idolise their courage to try and succeed where there's either a different language, time zone and routine in general. Belgium isn't a million miles away from us, but to move on to pastures new is an achievement and to be a success is even better. Thanks to @MGGame89 for this article. Check out ‘What A Load of Waffle’ @walow_pbfl for more on Belgian football.